Easy to use In most cases you simply place the EZ Jack, rocker side up, under the good tire and drive up the rocker until the tire to be serviced has cleared the ground. 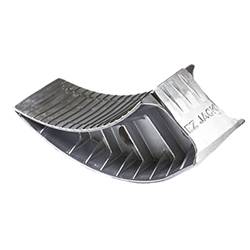 For trailers with low fenders, EZ jack can be used in reverse position, with the rocker side down for 2 inches additional height. In either position, once the tire has been changed, simply drive carefully off the low end of the EZ Jack. Rugged. Ez Jack is made of heavy-duty, cast aluminum. It is designed for rugged use, extreme weight and weather variations. Its one-piece construction and light weight allows for ease in handling and storage. It is guaranteed against breakage when used under normal conditions. Functional EZ Jack also functions as an excellent wheel chock when in the reversed position. It is designed to provide a firm hold on just about any surface. It is ideal for parking your trailer or chocking on inclines. EZ Jack also serves as the perfect solution for leveling recreational vehicles. Its light weight and one-piece design make storage a snap. EZ Jack was designed as an easy-to-use, safe and reliable device for changing tires on tandem axle trailers. Its unique rocker shape allows trailer operators to simply drive the trailer onto the EZ Jack to elevate the tire to change. No more hassling with awkward jacks or wooden blocks. Rated to accommodate weight up to 20,000 lbs.